Like the other eastern monotheist religions, Islam has incorporated ‘well worship’ into their cannon of faith and indeed there are many parallels. Most significantly perhaps is the way in which this worship, like Christianity, has fallen out of favour. Indeed, the Quran strictly forbids the worship of such sites for the virtues alone which is interesting and has meant these sites, which doubtless in some cases have a pre-Islamic history, have been firmly associated with the founders of this faith. Islam states that no one can own water, as understandably, it was seen as a sacred gift, similarly the Quran states any who pollute should be severely punished. These views were understandable considering the faith’s distribution in the dry and arid parts of the Middle East. 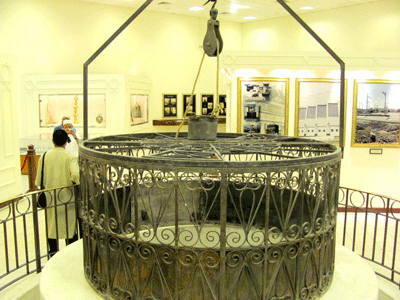 The greatest example of this of course being the ZamZam Well, in the holiest city of all Mecca, associated with Prophet Abraham’s wife and son, Haijar and Ishmael. Tradition accounts that whilst looking for water for her son and dying of thirst, she ran seven times between the hills to find it. Finally they were saved when a spring miraculously flowed from the desert sand. Abraham discovering their survival travelled to Mecca and he and Ishmael built or rebuilt the Kaaba to celebrate the miracle. Modern pilgrims remember this search in the Hage. The worship of springs became in the 10th and 11th century interwoven into the celebration of Islamic saint worship. Some interesting parallels can be seen between European Christian springs and those of Islam. An example being the Auliya spring, which means holy in the local language of Bashkira is said to have arisen after locals buried three local Islamic missionaries on Mount Aushtau mountain. Even more interesting is the fact that the spring is more powerful in May, the 15th, a date possibly significantly close to old May Day, with pilgrimages akin somehow to Spaw Sunday and others descended perhaps from the ancient Beltaine. Indeed, the water is said to flow only for 30 days. The placing of rags is also present at Islamic sites. The hanging of rags on trees associated with springs abound in Iran according to Ilʹi͡a Pavlovich Petrushevskiĭ (1985) Islam in Iran. Pilgrims in the Turkish village of Telekioi, would after filling a keg of water from a spring that rises near a saint’s grave or Tekke would hang a piece of cloth on a thorn tree over it. These vestiges of tradition clearly predate their present affiliations, explaining why some sections of the faith ignore or actively discourage. Yet like the well worship of the Christians – such activities run deep. An indication of the ancient origin of the springs of Islam can be indicated by cross pollination with older religions in the regions Islam colonised, akin to that seen in Christian areas. More often the support of such traditions would be in line with Sufism, a more moderate form of Islam, which accepts the recognition of saints and by doing so appears to have incorporated pre-Islamic forms of worship. One clear example is that of Alexander the Great who is reported found a spring created by God behind Mount Qaf, Chishmah-i-Ayyub, Well of Life. Its water was said to have been able to grant eternal life to those who drank it and was whiter than milk, colder than ice, sweeter than honey, softer than butter and sweeter smelling than musk. The spring lay in a land called the Land of Darkness and it is reported that one of Alexander’s men, Khidr led his army into it and found the spring. He bathed in the water, drank it and duly became immortal. However, when he attempted to show Alexander the spring he failed to find it and it has not been found since! Another version states that Khidr became immortal as the Green Man as he fell into the well and appears to Sufi adepts. Returning to the ZamZam well it is interesting that Abd Al-Muttalib, grandfather of Mohammed (pbuh), cleaned the well and found two golden gazelles and a number of swords. It is also thought that by bathing in the spring a woman can break with heathen gods, but an impure person dare not approach the spring. Baptism is of course a significant use of springs, although that term is of course a Christian one. It is worth noting that in the Yezidi faith which has Sufi elements has the use of the Kānīyā Spī or the White Spring for Mor kirin and that on the 23rd September a tree trunk would be immersed into the spring head. Jamkaran is a modern shrine including a holy well in a tradition akin to Marian shrines of Catholicism. Here a well behind the mosque is said to hide Imam Mahdi, the Twelfth Imam and that since the mid 1990s, pilgrims tie small strings in a knot around the grids covering the holy well which they hope will be received by him. The site in Iran is a clear example of an increase in the popularity of such worship again paralleling that occurring in many Christianised parts of the globe. Water worship despite the prohibitions appears still to have some significance in these regions and I would welcome any more information on them.